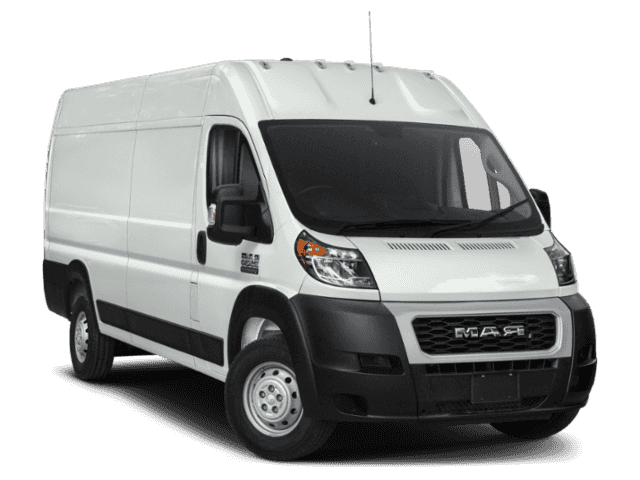 The ProMaster 3500 has a 3.6 liter V6 Cylinder Engine high output engine. This 1 ton van has an automatic transmission. Front wheel drive on this Ram ProMaster 3500 gives you better traction and better fuel economy. It is equipped with a gasoline engine. The ProMaster 3500 shines with clean polished lines coated with an elegant white finish. Anti-lock brakes are standard on this Ram ProMaster 3500. The vehicle has air conditioning that feels like a walk-in refrigerator. Protect this model from unwanted accidents with a cutting edge backup camera system. Electronic Stability Control is one of many advanced safety features on the vehicle. Bluetooth technology is built into this vehicle, keeping your hands on the steering wheel and your focus on the road. It features heated side mirrors keeping the ice off and your vision spot-on. With the adjustable lumbar support in the vehicle your back will love you. This model has convenient power windows. The ProMaster 3500 has satellite radio capabilities. The ProMaster 3500 is built for driving comfort with a telescoping wheel. The ProMaster 3500 features tinted windows. You will have no problem towing your boat or trailer to your next outing with this model. This model comes standard with a state of the art traction control system. Track your miles and travel time in this unit with the trip computer.